The dog on the back of the sofa is TOO funny. If you get that much pleasure out of those pillows they are worth every penny. I love them, they do add alot to the room. Sometimes you just have to splurge! Oh I heart them as well. I did something similar but ordered the roman shades from PB of this same fabric. I love the fabric and can't wait until it comes in the mail! It looks great in your living room! Cheers. Gorgeous. And they really add some punch to your room. Love it! I totally get it! If they polish off the room in the perfect way, you can't NOT get them. Thrift shopping is a crap shoot. You come home with something you had no idea you needed most times. LOL And that can be pricier than simply buying your one retail item you NEED. Well done! Looks very pretty! I love those pillows however, I hate to tell you this..but I feel like you should know. I saw those pillows in HomeGoods the other day. They may not be exact, however very very similiar. I'm not sure if you have a HomeGoods near you, but I can bet they were alot cheaper. Never the less...they are beautiful. Sometimes we have to act on impulse and if you can't live with out them...then I say buy. I have also been "eyeing" these pillows...they are beautiful and worth every penny if they make your heart pitter patter with every glance! I basically shop by the same rules you do; however, I have one other very important rule I try hard to stick to: Only buy what I absolutely L.O.V.E. By doing this, it weeds out all those impulse buys or purchases just because it was so "cheap". I actually save more this way. So, in your case since you LOVE those pillows so much, I say it was a wise buy and enjoy them!!! I love them! A splurge like that is really fun from time to time. Enjoy them! If it makes you happy then I say splurge. i was hoping you were going to say you found this awesome fabric and then I was going to go and order yards of it for my family room. I have been looking for something just like that to make some pillows and maybe a cover for the ugly dog crate that has to sit behind the sofa. Oh well, a girl can dream. Love the pillows! They really do make the room. As Sheryl Crow sings "if it makes you happy........it can't be that bad". Your room looks fab! Love the pillows! Justification. It's a great way to not feel bad about spending the money. Your steal on the rug offsets the price of the pillows. How do you like the like color of your sofas? 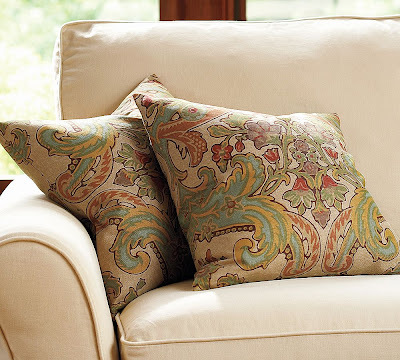 I am looking for a change and have been going back to that color in a custom slipcover, but am afraid to take the leap. They look fabulous! I don't blame you, once a while to spend doesn't hurt. Come by when you have a chance, I have a design dilema. Sometimes a splurge is just the right thing. And looking at your pictures, it looks like a great splurge. How nice your mom was to do that for you. No shame! These look fantastic in you space so they're totally justified in my book! I have spent every day since I moved in shopping for pillow covers for my three sofa pillows. They are just so pricey and so many of them are so seasonal. But these are gorgeous! And are the colors I was looking for... OH no, now I'm wondering if I should make a run to MY local PB. The pillows are gorgeous and I can def understand why you splurged! They are beautiful. You could consider them a gift to yourself and think of all the ways you have saved money on other things. $80 is pretty reasonable for heart therapy. I would have done the same thing! Sometimes you gotta go for it. I have been eyeing these pillows for a while now so it's really funny that while blog hopping I found you and this post about your gorgeous pillows!! In fact, these pillows inspired me to paint our office/den which is just off the living room that wonderful shade of blue in your pillows!! I keep thinking that they've got to have the fabric for sale, so that I can make more than two pillows for $80, but I may just have to splurge like you!! Fun to find your blog! Love those pillows, didn't as much until your pic of them. The PB pic doesn't do them justice as far as the colors. And I love that jute rug too! Too bad Pier 1 doesn't have it anymore! Cute! I am in love with your pillows now too! Gorgeous! I can see why you couldn't get them out of your mind. I occasionally break the rule of waiting for the sale too...I do say you have to love it, and you do! Enjoy those gorgeous pillows! Hi Nice to meet yo! I love your blog! what a fantastic deco! I love it! Oh, they're beautiful. Here's to never regretting them. It's fun having a "splurge" every now and then. hey AN. Your room is really coming together! I love the new rug as much as the new pillows. It is sooooo you! I DO love that fabric! Hey, a girl's gotta do what a girl's gotta do!!! Glad you got crazy and went for it. Stop by and join my Uppercase Living giveaway! Great pillows! Love the delicate colors. I love them and if they make you "pitter-patter" then that can only be a good thing right? And, I'm sure you got SOME kind of bargain on the rug right? That has to be factored somehow in this, right? I mean surely you can justify the pillows and the savings on the rug somehow, you're smart like that!! No matter, the pillows are gorg and do look outstanding in your room and on your couch, and the dog just helps bring out that extra something - I think its called life!! I love your living room walls colors! What are they? I love those pillows, they are gorgeous and a great pop of color! I think it all works out just fine since you got the rug for only $30. Think of it in reverse, it's like you paid $80 for an area rug (not too bad for a big rug) and only $30 for the pillows which works out to $15 a pillow. I saw them at pottery barn and loved them also! They look wonderful in your room!! lol...I didn't even see the dog....Too Funny!!!! I can't believe I left your blog over an hour ago then came across it again from a google search for "Oil Rubbed Broze Spray Paint" and now here I am admiring photos of your living room. How funny! Hi! I know that this is an old post but I have drapes made from the same fabric as the pillows in this post. I am looking for a wall paint color. What is the paint color of your wall? BTW, do you still have your pillows? LOL!